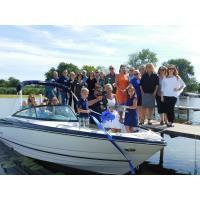 The Barrington Area Chamber of Commerce gathered for a ribbon cutting ceremony on Tuesday, July 11 to celebrate the opening of the Barrington Boat Club, located at 99 Kazimour Dr. in Port Barrington. Barrington Boat Club is designed for people who want to enjoy the luxuries of boat life without the hassles of owning a boat. Those who join can choose from a variety of premium boats to reserve throughout the summer. “All our members have to do is make an online reservation and we will have the boat uncovered, gassed, and ready for them to use,” said owner Michelle Streit. For more information call Barrington Boat Club at (847) 380-5488 or visit www.barringtonboatclub.com. Lisa Earnhart (LM Harrison & Associates), Stephanie Daley (Barrington Boat Club), John Jackson (4ci Mgmt - Balancing Life's Challenges), Martha Goodman Stack (Wells Fargo Advisors), Norman May (Full Service Office Solutions, Inc.), Amber Wirkus (Holiday Inn Express Lake Zurich), Melissa Khamkhounnavong (@properties | The Luby Group), Suzanne Corr (Barrington Area Chamber of Commerce), Carol Kuczkowski (USANA Health Sciences) and Annette Bochenek (Barrington Area Library). Pictured in the boat (l-r) are: Payton, Cathy, Harper and Cindie Streit, Tory Aevermann, Maxden, Maven, Dillon, Michelle, and Malayna Streit (Barrington Boat Club).